The museum is located in the 228 Peace Park. Take the Tamshui-Xinyi Line, Line 2 or Red Line to NTU Hospital Station Exit 4, then walk for 3-5 minutes crossing the 228 Peace Park to the Museum. Take the Bannan Line, Line 5 or Blue Line to Taipei Railway Station Exit 5, then walk to Xiangyang Road along Guanqian Road for about 5 minutes. Take the bus to one of the stops: Taiwan Museum (Quanqian Rd. ), Taiwan Museum (Xiangyang Rd. ), MRT NTU Hospital Station, or Taipei Main Station (Zhongxiao), then walk for 3-5 minutes. For more information, visit the website of Taipei Bus Information and Transit System. Ride the UBike and stop at the Exit 4 of MRT NTU Hospital Station on Gongyuan Road, then walk for 3-5 minutes crossing the 228 Peace Memorial Park to the Museum. For more information, visit the website of YouBike. 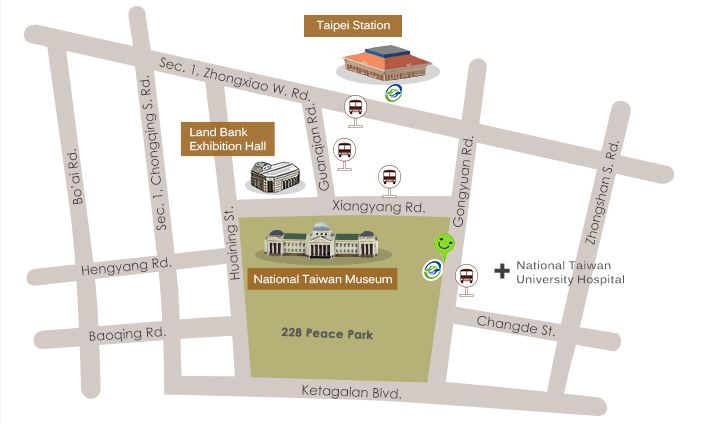 The Museum is near the Taipei Station, conveniently accessible by metro, bus, train or HSR. Along Guanqian Road, it takes about 5 minutes to walk from Taipei Station to Xiangyang Road.